With the vigorous development of China’s aviation manufacturing industry, statistics predicts that, in the future 10 years, China’s aviation materials market and the related processing equipment overall market scale will reach 120 billion Yuan. Under that background, LI Hongping, Director of Metal Material Department in COMAC Shanghai Aircraft Design and Research Institute, gave a detailed introduction of Development of and Outlook on Materials of China Domestic Civil Aircraft at 2nd Annual China Aeronautical Materials and Process Summit (hereinafter "summit"). And, Deputy Chief Engineer of COMAC Shanghai Aircraft Manufactures Co., Ltd., CHEN Lei, opened Day Two with his speech named as China Commercial Aircraft Manufacturing Technology Research and Development. Aeronautical Material has a close relationship with aeronautical technology, and it enjoys vital status because not only is aeronautical materials substance guarantee of aviation product researching, but also it is technique basic of aviation product upgrading. Among all of aeronautical materials, metallic material has been widely used and completely focused in this field owe to its micro density, thermo stability, high hardness, etc. This Summit boasts 7 speeches about metal alloy materials including Rhenium, High Temperature Titanium, Cast Aluminum Alloy, High Temperature Alloy and so on. At this Summit, Mike BOND, Business Development Manager of Aeromet International PLC, with a series case study, presented himself that A20X is a modified Aluminum-Copper Alloy and the solidification mechanisms has been modified through alloy addition, including TiB2 in his speech of A20X, the World’s Strongest Cast Aluminum Alloy- Now in Serial Production. In addition, ZHANG Yansheng, Quality Director of BAO TI Co., Ltd. launched a furious discussion on the topic, Titanium Alloy Materials Development and Requirements in China Aviation Market. He analyzed application condition of titanium alloy in typical domestic and foreign aircraft and introduced titanium alloy material and manufacture and development. And he further indicated that titanium has been more and more applied to a lot of fields such as aviation industry, nuclear power industry, ship industry, petroleum industry, power industry, and etc., thus becoming important strategic metallic materials. Application level of titanium has also become an important index to measure comprehensive strength of a country. With successful development and mass production of Chinese large-type passenger plane and feeder liners, it must further advance another rise of Chinese titanium industry. In the process of aerospace manufacturing development, the upgrading of materials has been at a high-speed, and materials and aircraft are always developing under their mutual promoting. The slogan---One Gen Materials, One Gen Aircraft is a mirror of world aerospace developing history, which is authenticated by the rise and use of composite materials in aerospace industry field. Therefore, YI Xiaosu, Science and Technology Committee Director from AVIC Beijing Institute of Aeronautical Materials delivered a speech that Development of High-Performance Structural Composites with Multi-Functionality for Aerospace Application where she show domestic and foreign attendees electrical conductivity of composites and integration of structure and function, FIT nanometer hybrid technology , SIT composite toughening technology, ESÔ exclusive for liquid molding and international cooperation. Meanwhile, CHEN Guangchang, Material Department Leader Engineer of AVIC China Helicopter Research and Development Institute addressed himself in the speech, Helicopter Composite Material Structure Characteristics, Application Status and Development Trend, that Civil helicopters have not only effectively impelled the instant development of global economy, but have also considerably improved people’s quality of life. The number of civil helicopters in possession in a country has turned into an important indicator that measures its economic strength and development level. High-performance and energy-efficient helicopter should be furnished with efficient structure. The extensive use of well-developed composite materials is considered one of the most effective way to improve structural efficiency, as well as one of the key indicators for helicopter’s sophistication and economy.As the foundation of manufacturing industry, process perfectly complements with materials. Thus, process has been added into this summit agenda. At this Summit, ZHUANG Hongxing, C919 TCT Technical Observation Post Engineer of CAAC Shanghai Aircraft Airworthiness Certification Center, gave a speech that Validation of Special Technical Process for Airworthiness Certification where he indicated that with continuous research and development of our national process, there will be an increase of special technical process applying in civil aircraft manufacturing. Furthermore, it is important for civil aircraft airworthiness certification to apply validation on civil aircraft special technical process. This summit has lasted for two days which has gathered domestic and foreign aeronautical materials and process elites. 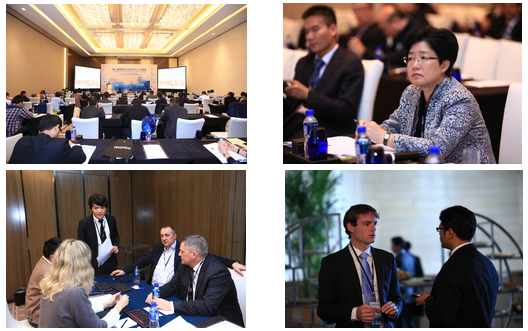 It is said that next China Aeronautical Materials and Process Summit will be held in Beijing in November, 2015.